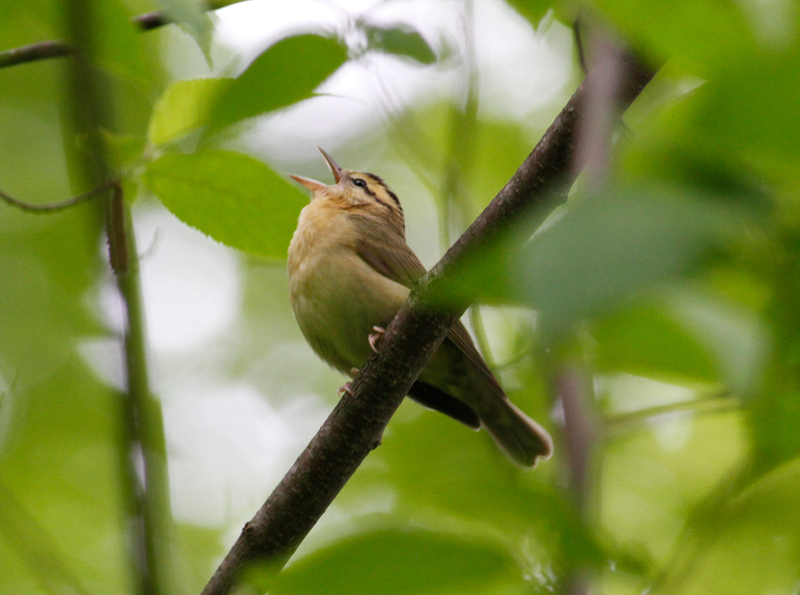 Worm-eating Warbler - Deerfield, Franklin Co., MA. May 25th, 2017. 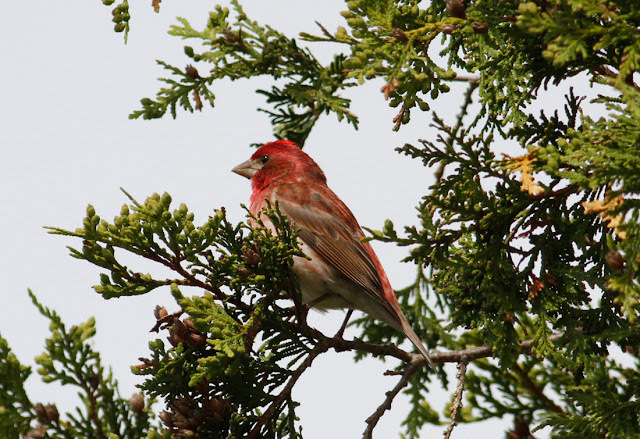 Late May often produces some very good birding in the Pioneer Valley and this year was no exception. 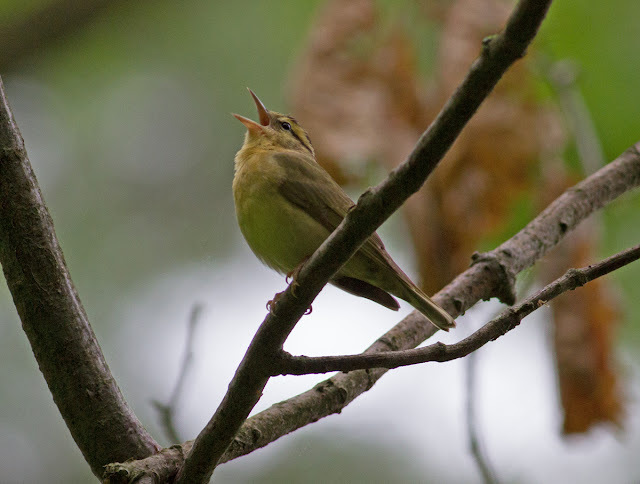 It's usually a good time to find 'boreal' migrants appearing alongside breeding birds, and we didn't have to look any further than our own yard in Northfield where Swainson's Thrush, Blackpoll and Mourning Warblers all appeared on the 20th. 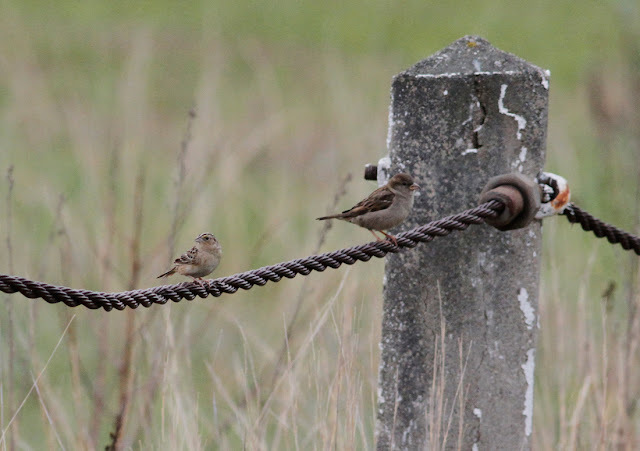 Indeed, the passage of Blackpoll Warblers continued through to the 26th at least with, for example, 18-20 singing males counted on a 14 mile bike ride between Greenfield and Northfield on the 24th. Brian Kane and friends also had a nice Olive-sided Flycatcher in Montague on the 21st. 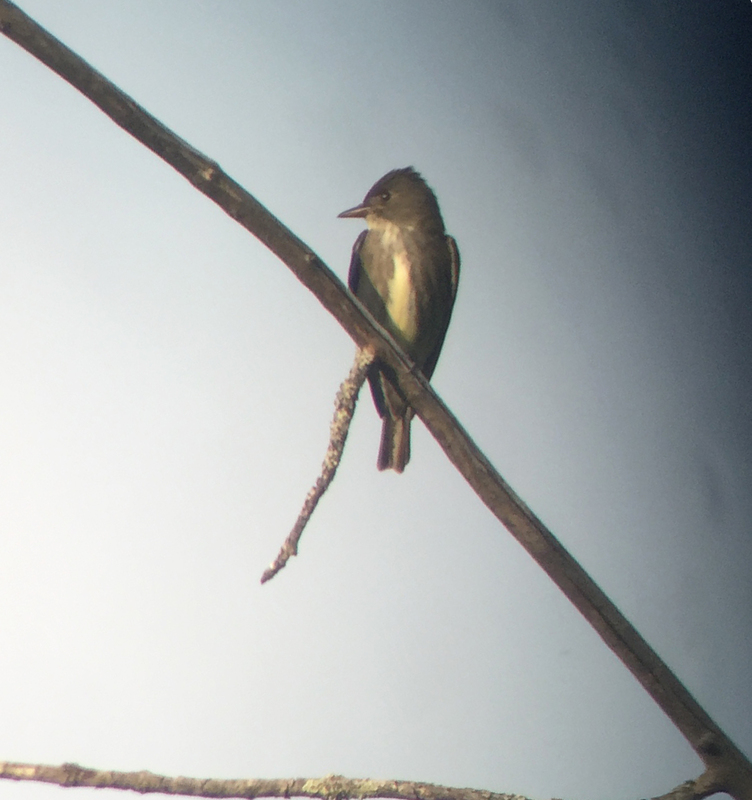 Olive-sided Flycatcher - Meadow Street, Montague, Franklin Co., MA. May 21st, 2017. Image appears courtesy of Alan Snow. Ideal conditions (wind, rain and reduced water levels) at Barton Cove, Gill produced a nice arrival of Arctic-bound shorebirds on the 22nd/23rd and with 7 Black-bellied Plovers, 18+ Least Sandpipers and single Semi-palmated Sandpiper and Dunlin at the very least, and I am aware that birders reported more shorebirds from the Turner's Falls Rod & Gun club, a site which I couldn't visit on the 22nd. Also of interest on the 23rd (with Brian Kane), a Great Egret at the Rod & Gun Club and at least 3 Black Vultures over Rt 2 in Greenfield soaring with a handful of Turkey Vultures . Black-bellied Plovers - Barton Cove, Gill, Franklin Co., MA. May 22nd, 2017. Four of the seven birds present on the 22nd. 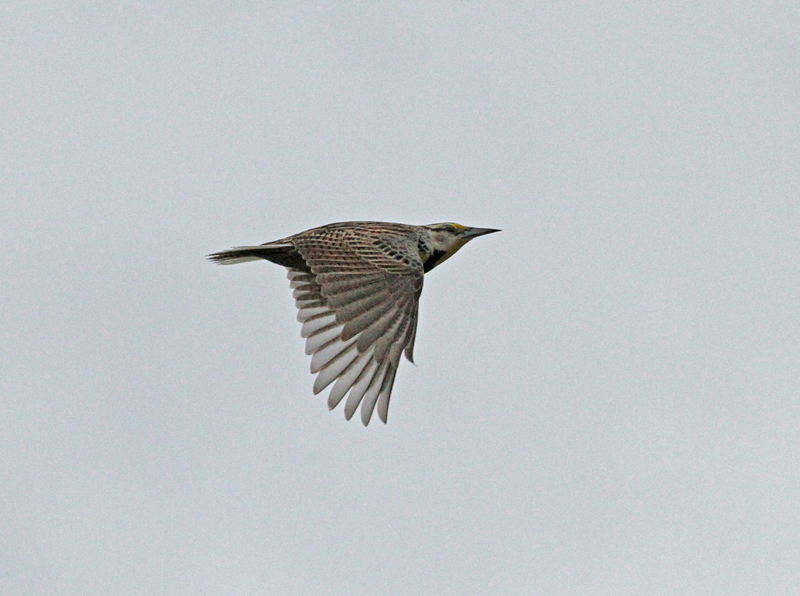 Eastern Meadowlark - Gill, Franklin Co., MA. April 30th, 2017. Purple Finch - male, Gill, Franklin Co., MA. May 23rd, 2017. 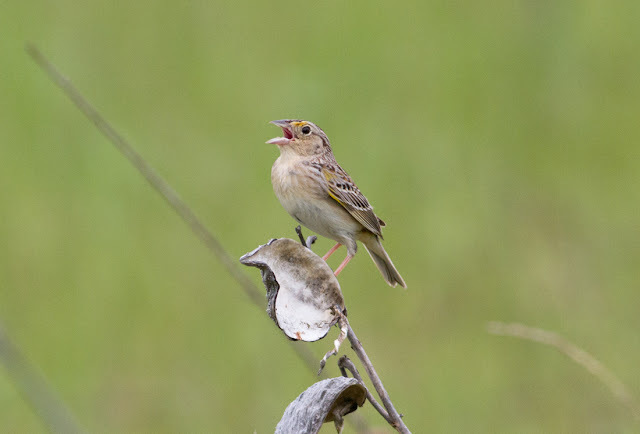 Grasshopper Sparrow - Montague, Franklin Co., May 21st, 2017. Grasshopper Sparrow (with House Sparrow) - Montague, Franklin Co., May 23rd, 2017. MA - grand fall-out of migrating waterbirds at Turner's Falls! Black Tern - adult, Turner's Falls Rod & Gun Club, Franklin Co., MA. May 2nd, 2017. May 2nd: Overnight thunderstorms and very heavy rain persisted through to dawn. I decided to trade my early morning bike ride for a quick visit to Barton Cove, Gill and arrived at the public boat ramp at 06:22 hrs. Within minutes I was looking a some good waterbirds with clear indications of an overnight arrival: two Bufflehead, a Long-tailed Duck, two Common Loons, a Horned Grebe (in near full breeding plumage), five Northern Shoveler and a flock of 36 Green-winged Teal - not too shabby for starters! 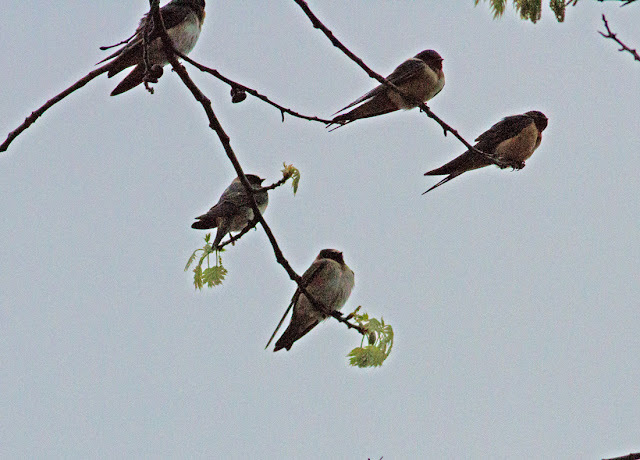 Scanning through the swallows, I came across several Cliff Swallows when Eric Huston called with news of a 'hooded' gull from the Turner's Falls Rod & Gun club. 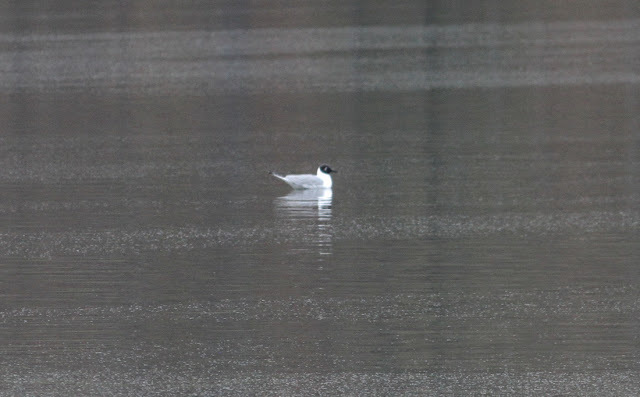 He was understandably cautious, as the previous day I'd seen a summer plumaged Bonaparte's Gull at the same spot, but he seemed pretty confident that his distant bird was a Laughing Gull - exceedingly rare for interior Massachusetts. Laughing Gull - adult in breeding plumage with Ring-billed and Herring Gulls, Turner's Falls Rod & Gun Club, Franklin Co., MA. May 2nd, 2017. 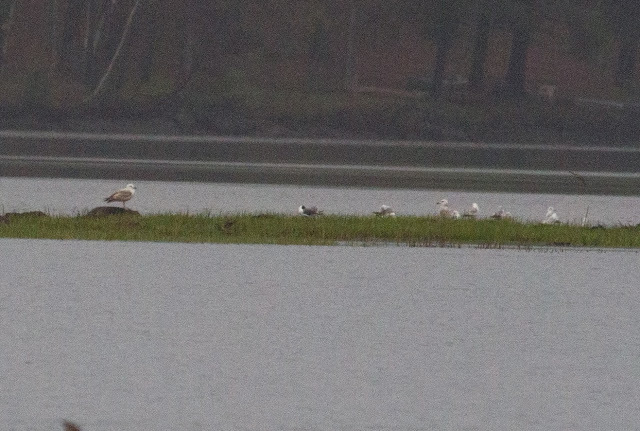 The dark hooded, dark mantled gull in the center of the island. 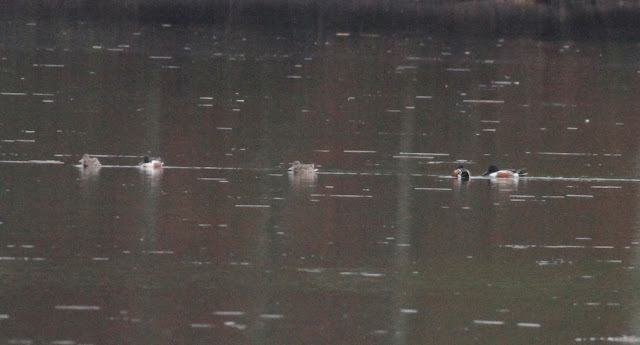 Distant but readily identifiable through a spotting scope. A good find for Eric Huston, only the second documented record for Franklin County. Long-tailed Duck - male-breeding, Barton Cove, Gill, Franklin Co., MA. May 2nd, 2017. One of four Long-tailed Ducks today. Northern Shovelers - five, Barton Cove, Gill, Franklin Co., MA. May 2nd, 2017. 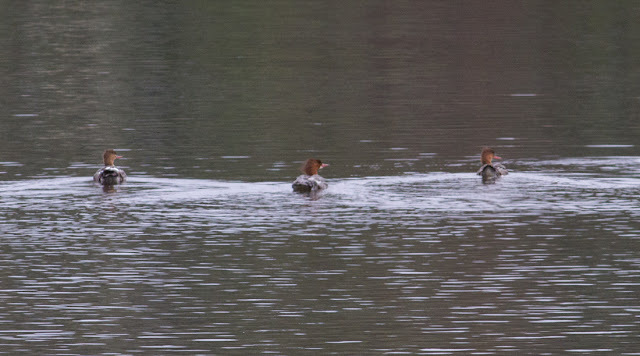 Red-breasted and Common Mergansers - Turner's Falls Rod & Gun Club, Franklin Co., MA. May 2nd, 2017. 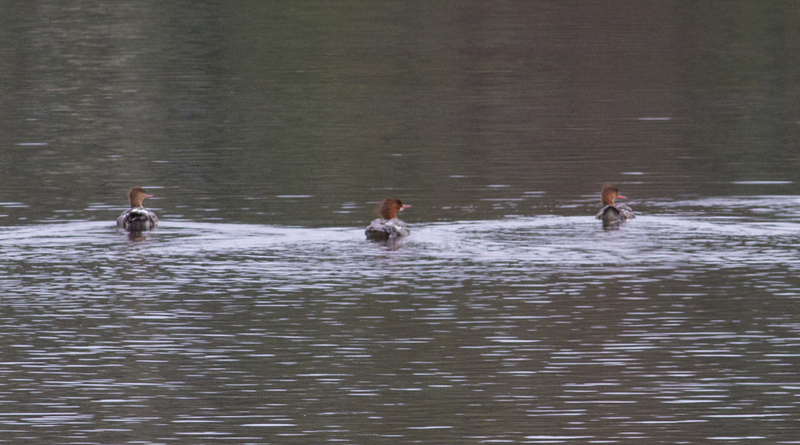 Common Merganser flanked by two Red-breasted Mergansers. 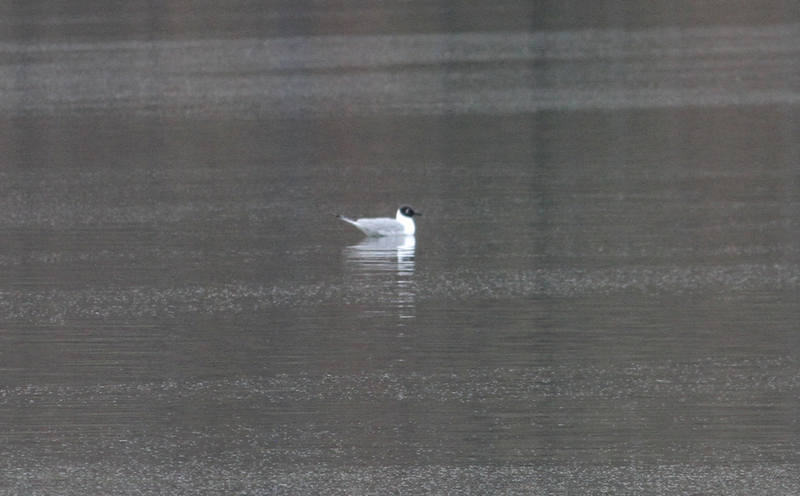 Bonaparte's Gull - adult-breeding, Turner's Falls Rod & Gun Club, Franklin Co., MA. May 1st, 2017. Five minutes later I was fortunate to find Eric and the Laughing Gull still present at the Rod & Gun club. 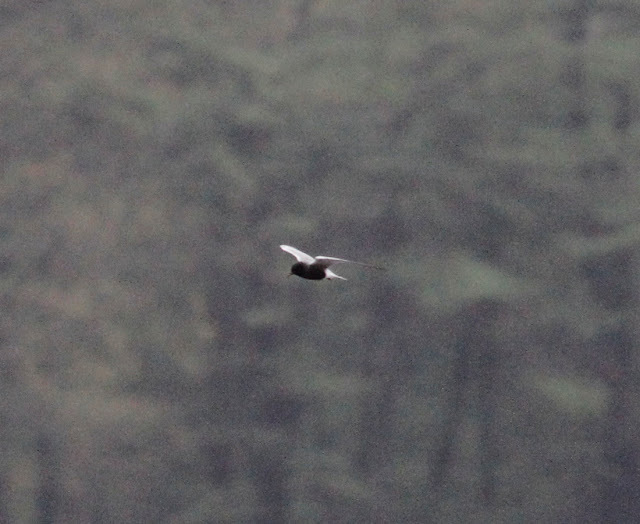 It was distant and resting on a small island which's only exposed when water levels (controlled upstream) are low. 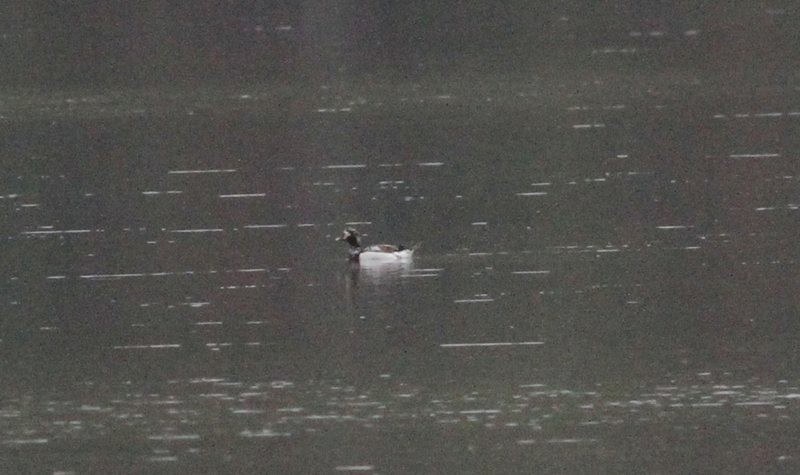 Around the same island, 3 female Red-breasted Mergansers and a first-summer Common Tern......wow! 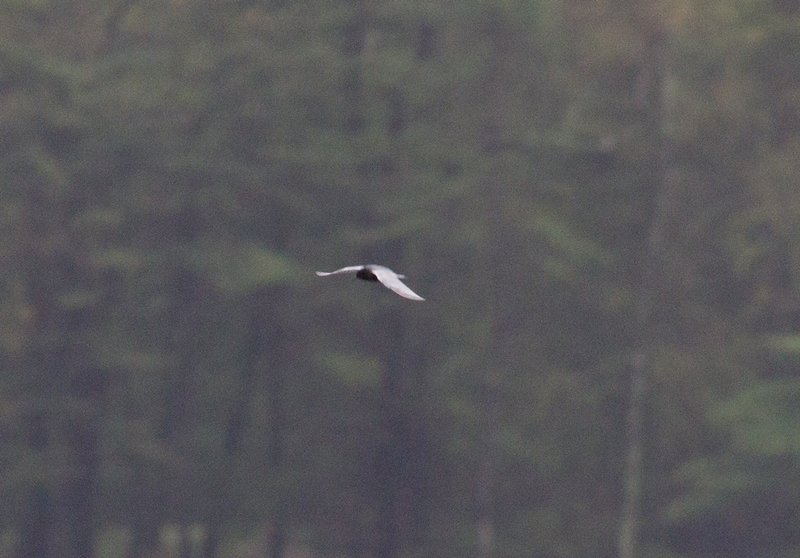 Eric had to leave for work but I had enough time to linger for another ten minutes or so and could hardly believe my luck when a Black Tern in breeding plumage flew through my field of view as I watched the Common Tern. With brightening skies, I returned to the Rod & Gun club after dropping Matan at school, hopeful of improving on the documentation shots of the Laughing Gull. Alas, the favored island was already underwater and all the birds that it had been holding had moved on. It later transpired that Josh Rose and Bill Lafley had seen and reported the Laughing Gull at Barton Cove, just a little downriver from the Rod and Gun Club. 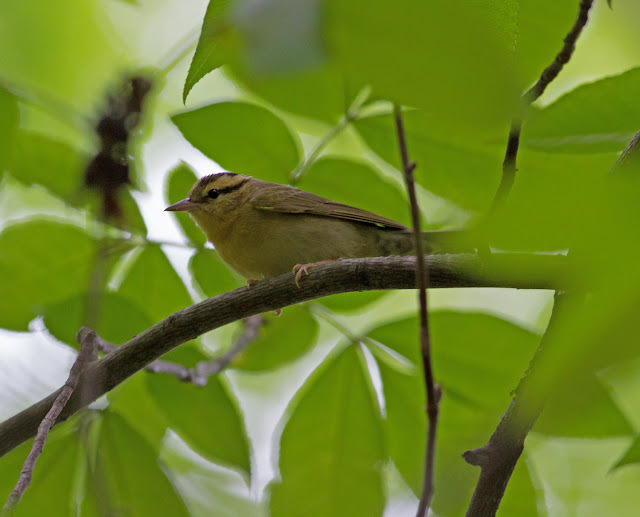 However, the latter site still held 3 Long-tailed Ducks, a Horned Grebe, a Common Loon and 2 Red-breasted Mergansers as well as Great Crested Flycatcher, Black-throated Blue Warbler and Northern Parula and no less than 10 Cliff Swallows. Shorebirds included 2 Greater and 1 Lesser Yellowlegs, Solitary Sandpiper, 2 Least Sandpipers and plenty of Spotted Sandpipers. 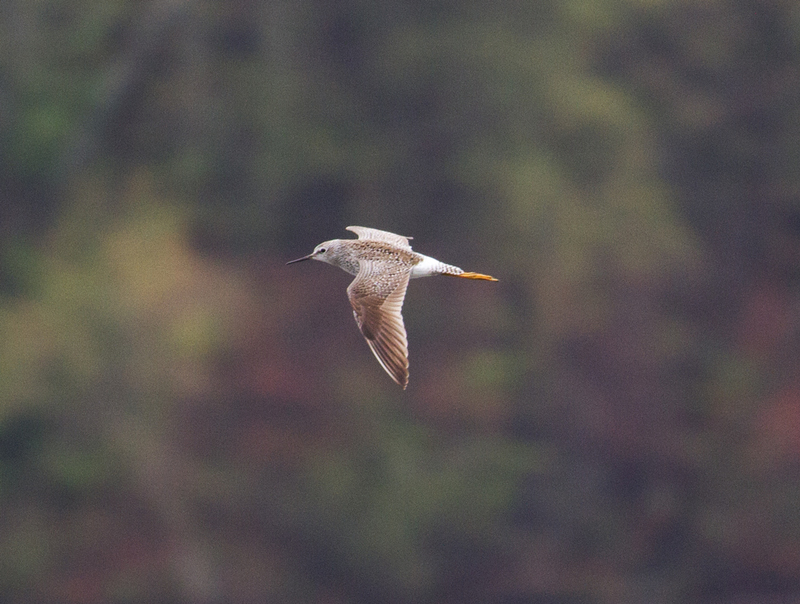 Lesser Yellowlegs - Turner's Falls Rod & Gun Club, Franklin Co., MA. May 2nd, 2017. Cliff and Barn Swallows - Turner's Falls Rod & Gun Club, Franklin Co., MA. May 2nd, 2017. By 09:15 activity seemed to be tapering and the Laughing Gull had already moved on from Barton Cove by the time that I arrived back at the boat ramp. Other than a singing Northern Waterthrush, I didn't really add anything new to the species haul in the few minutes that I spent there. Even so, by local standards this was a pretty thrilling morning to be out.